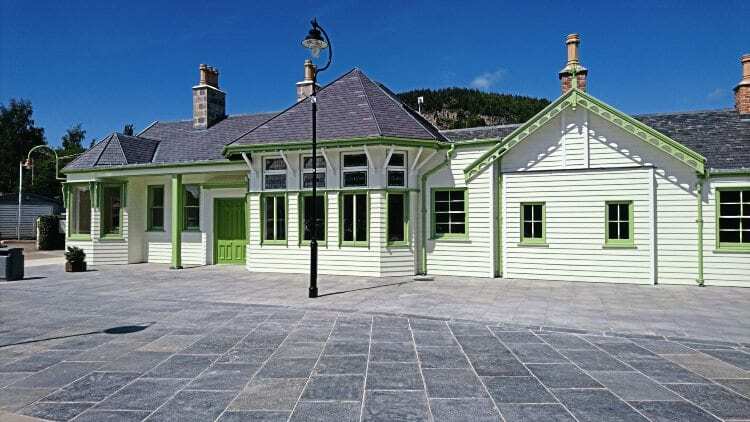 BALLATER’S historic ‘B’-listed railway station was destroyed in a fire just over three years ago, but on August 20, the rebuilt station was opened to the public. The station was a terminus on the Great North of Scotland Railway line from Aberdeen, and being close to Balmoral Castle, was used by the Royal Family until the line closed in 1966. It later became a visitor centre and home to several local businesses. At the time of the fire, Aberdeenshire Council pledged to rebuild the station, with a two-year estimate, and while it has taken longer, the station retains its mix-use status, and includes an information centre, a restaurant and tearoom run by The Prince’s Foundation – plus the Royal waiting room and carriage that was saved during the fire. There is also a new space extending along the old platform and over the tracks where the royal carriage sits, taking the form of railway sheds, mixing royal heritage with local history. The royal waiting room interior has been carefully repaired by specialists to ensure the quality matches what was lost in the fire.